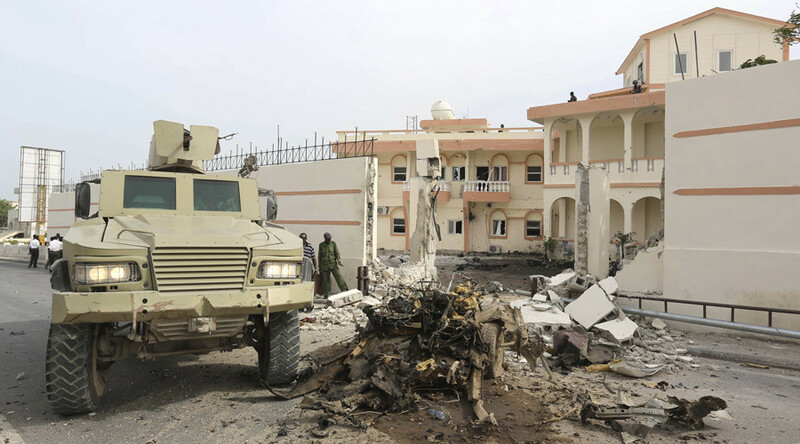 Fighters from the Al-Qaeda-linked Al-Shabaab terror group claimed responsibility for setting off a car bomb and attacking a hotel in the center of the Somali capital of Mogadishu on Friday. Police say 12 people have been killed. According to the militants, they stormed the Somali Youth League hotel, also known as the SYL hotel, which is located in the heavily secured area near the presidential palace. "We started with a car bomb and then stormed the hotel. We are inside it and fighting continues," Al-Shabaab's military operations spokesman, Sheikh Abdiasis Abu Musab, told Reuters. A police official could not confirm whether the militants were inside the hotel. "I heard an exchange of gunfire around the area. I am not sure whether or not the attackers are in the hotel," police Major Ahmad Ismail told Reuters. At least 12 people were killed in the attack, AFP reported, citing police. There have been two blasts, a police official told AFP – one by the hotel gate and another near the park located next to it. “One of the blasts took place near the Peace Gardens [park] and the other near the SYL hotel. I saw 12 dead civilians, but the toll may well be higher,” Ibrahim Mohamed said. Another police officer has said the bomb exploded at a gate behind the hotel, with people having escaped through another entrance. “My sister, class mates and I were taking pictures at the Peace Garden when the car bomb hit the gate of the park. We all rushed through the back gates,” witness Halima Nur told Reuters, adding that there were a lot of people in the park when the attack happened. As people rushed to escape, there was “nearly a stampede,” she said. The hotel had previously been targeted by terrorists last year ahead of a visit from the Turkish president, when they set off a car bomb outside its gates, killing three people. Somali President Hassan Sheikh Mohamud announced on Somali Cable TV on Thursday that nearly 200 Kenyan peacekeepers had been killed in Somalia in January when Al-Shabaab attacked an African Union military base. The Islamist militants stormed the facility in the southern village of el-Adde on January 15 in what was possibly the group’s most successful attack on the AU mission. The 20,000-strong AU contingent helps Somalia battle militants affiliated with the international terrorist network.